During his lifetime, Leonardo DaVinci designed a remarkable number of machines and constructs. Among these inventions were various devices intended for warfare. While many of these designs were put to use, some of the more elaborate ones were never truly realized..... yet, imagine if they were. 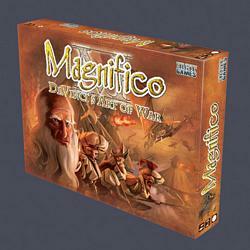 Magnifico DaVinci’s Art of War is an inventive board game of military conquest for 3-5 players. Set in an alternate history where DaVinci’s fantastic machines of war were mass-produced and fielded in battle, Magnifico offers a unique vision of 16th century warfare. Players are tasked with becoming the next “magnifico” by conquering the most lands, acquiring the most works of art, and constructing the most projects for their people. Magnifico comes with a With its blend of elegant mechanics and customizable inventions, Magnifico creates a strategic game that’s easy to learn and play. Do you have what it takes to become the next magnifico?